1997-09-26 First worldwide family litigation filed litigation Critical https://patents.darts-ip.com/?family=10697844&utm_source=google_patent&utm_medium=platform_link&utm_campaign=public_patent_search&patent=EP0521642(A1) "Global patent litigation dataset” by Darts-ip is licensed under a Creative Commons Attribution 4.0 International License. A method of filling a can with a non-carbonated product comprises in sequence the steps of (a) filling an open topped can with the product to leave a headspace; (b) blowing a permanent gas into the headspace to substantially fill the headspace and displace water vapour form the headspace; (c) seaming a can end onto the can to close the can; and (d) deforming the can end or can bottom from a first stable shape to a second stable shape so reducing the headspace volume and increase the headspace pressure to a level such that in anticipated conditions of processing, transit and storage the internal pressure remains above 1 atmosphere. The benefits arising are that cans having a thin side wall are supported against abuse or collapse and the cans remain in their desired shape. The invention relates to the filling of cans and in particular to the filling of cans with a food or non-carbonated beverage. It is commonplace to use lightweight drawn and wall ironed (DWI) cans for the packaging of carbonated beverages. Such cans consist of a one piece can body having a bottom wall and a cylindrical side wall, and a top can end which is seamed to the can body after filling. In this application, the internal pressure generated by the carbon dioxide content of the product may be of the order of 2 bar above atmospheric pressure at ambient temperature. This internal pressure, by placing the can walls in tension, contributes significant strength to the very thin side walls of such cans protecting them from damage by denting during distribution and maximising their top-load strength. Whilst such cans are capable of containing internal pressure greater than 7 bar above atmospheric, they are very easily damaged if the internal pressure falls to less than 0.4 bar above atmospheric pressure. Non-carbonated products are frequently hot-filled into cans and when such cans are cooled an internal vacuum is developed which dictates that the can walls should be relatively thick to withstand the vacuum without collapsing or panelling. To illustrate this effect, consider the case of a can which is filled with 300 ml of water at a temperature of 85°C and then closed by seaming on an end to enclose a total volume of 380 ml. When the end is applied to this can the 50 ml headspace will be filled with a mixture of permanent gasses and condensible vapours. The permanent gasses will be principally Oxygen and Nitrogen from the atmosphere and the condensible vapour will be principally water vapour arising from the hot product. At the moment the can is closed the combined partial pressures of the headspace constituents will equal the prevailing atmospheric pressure, say 1.0 bar absolute, and the temperature of the mixture will be close to that of the product due to the convective heat transfer from the product to the constituents of the headspace confined by the side walls of the can. At 85°C the water vapour will comprise about 58% of the mixture and permanent gasses will constitute the remaining 42%. In other words, the partial pressure of the water vapour will be 0.58 bar absolute and the partial pressure of the permanent gasses will be 0.42 bar absolute. This condition will prevail as long as the can is maintained at 85°C but when the can is cooled to 5°C, as when placed in a refrigerator, then consideration of the gas laws lead us to expect that the constituents of the headspace will behave differently. We expect the permanent gasses to obey the combined Boyles and Charles Laws and their partial pressure to fall to approximately 0.33 bar absolute. We expect the water vapour in the headspace to condense to the liquid phase until its pressure in the headspace reaches the equilibrium saturated water vapour pressure at the lower temperature. At 5°C this is effectively so low that it can be ignored, as can the small additional volume of liquid generated by the condensation. Thus, we expect the total pressure in the headspace at 5°C to fall to 0.33 bar absolute. As the surrounding atmospheric pressure remains at 1.0 bar absolute the walls of the can are subject to a differential pressure of 0.67 bar and hence must be relatively thick if collapse is to be avoided. In reality, the problem is further aggravated because the liquid contents contract substantially in volume as the temperature falls resulting in even lower pressures. Much effort has been devoted to methods intended to ensure that the pressure in the headspace of a can containing a non-carbonated product is maintained at a pressure significantly above atmospheric throughout its storage life thereby facilitating the use of lightweight DWI cans for such products. One such method as described in GB 2089191 A involves injecting a small quantity of liquid Nitrogen into the headsace of the can immediately prior to applying and double-seaming the ends. This liquid Nitrogen injection process suffers a number of disadvatages. The quantity of liquid Nitrogen which needs to be injected into each can is small and due to its extremely low temperature, difficult to handle and meter precisely. Thus there is significant variation in the quantities injected into successive cans. The liquid Nitrogen begins to boil immediately it is injected into the warmer product especially if the liquid breaks up into smaller droplets and gas escapes from the can before the end can be applied and the double seam formation completed. This results in significant and sometimes unacceptable variation in the final internal can pressure between neighbouring cans. An alternative mechanical pressurisation process has been proposed in eg. GB 1235060 and US 4836398. In these prior proposals, the can is provided with at least one deformable wall element, generally in the top or bottom end of the can, which is deformed after filling and seaming to reduce the internal volume of the can and thus to increase the internal pressure. This mechanical pressurisation process has not been found to be successful when used with hot-filled products, failing to prevent vacuum formation as the cans are cooled to low temperatures. This failure we now realise is due the behaviour of the water vapour present in the headspace when the can is mechanically deformed. D) deforming a part of the can from a first stable shape to a second stable shape to reduce the headspace volume thereof and increase the headspace pressure to a level such that in anticipated conditions of process, transit and storage the internal pressure remains above 1 atmosphere. According to the method step (d) may comprise deforming of the bottom wall of the can body or alternatively deforming of the can end which closes the top of the can body or if desired deforming of both the bottom wall and can end. By way of illustration consider again the previous case of a 380 ml can containing 330 ml of product at 85°C. As previously the 50 ml headspace at the moment of closure container permanent gas at a partial pressure of a 0.42 bar absolute and water vapour at a partial pressure of 0.58 bar absolute. If at this point the can is deformed by pushing in one or both ends to reduce its total internal volume by 35 ml, then, as the 330 ml of water are virtually incompressible, the headspace will be reduced to 15 ml. We expect the permanent gas content to obey Boyles law and its partial pressure to rise to 1.4 bar absolute. The water vapour, however, we expect to continue to exert 0.58 bar absolute, the equilibrium saturated water vapour pressure at 85°C, the excess vapour condensing to water. Thus we expect the total pressure in the headspace to become almost 2 bar absolute, at 85°C. If this can is now cooled to 5°C, the partial pressure of permanent gas is expected to fall to 1.09 bar absolute, and the partial pressure of water vapour is expected to become negligible. Thus we expect to see the total internal presure fall to 1.09 bar absolute, only 0.09 bar above atmospheric pressure and not sufficient to support the walls of a DWI can. The pressures quoted in the examples above are theoretical, based on simple considerations of the gas laws. When the experiments are conducted in reality the observed pressures deviate from the these theoretically calculated values tending to be lower than theory predicts. These deviations arise because the can volume and the volume of the contents change differently with temperature and because the can expands elastically with increasing pressure. In one embodiment of the method a can body is provided with a bottom wall which has a convex base portion comprising an annulus surrounding an outwardly concave central panel and in step (d) pressure is applied to the central panel to deform said convex portion to a concave form which supports the central panel inside the side wall in the form of said second stable shape. In an alternative embodiment of the method the can end comprises a peripheral double seam portion, a chuck wall depending from the inner periphery of the seam portion, an annular bead extending radially inwards from the chuck wall, an inner wall which extends from the annular bead towards the level of the seam portion to a radiused annulus which supports a central panel, and in step (d) pressure is applied to the central panel to deform the annular bead and inner wall until the centre panel is passed through the annular berad and the radiused annulus reversed to define with said inner wall said second stable shape. Preferably, the permanent gas is Nitrogen because it is readily available. In a second aspect, this invention provides a can end adapted for deformation from a first shape to a second shape, said first stable shape comprising a peripheral seam portion, a chuck wall dependent from the interior of the seam portion wall, an annular bead extending radially inwards from the chuck wall and an inner wall extending from the bead towards the level of the seam portion to a radiused annular which supports a central panel thereabove, said second stable shape comprising the peripheral seam portion and the chuck wall, said annular bead and at least part of the inner wall deformed to form a continuation of the chuck wall, from which depends the central panel at the level below that of the seam portion. If required the can end may be of the easy opening type in which the central panel includes an openable portion defined by a line of weakness which may be opened by means of a lever or tab attached to the can end. In a third aspect of the invention there is provided a can body having an end wall and a side wall upstanding from the periphery of the end wall, said end wall being adapted to permit deformation of the end wall from a first stable shape to a second stable shape, said first stable shape comprising an annular bead of arcuate cross section to join the bottom wall to the side wall, a convergent annulus extending axially and inwardly from the annular bead and side wall, and an outwardly concave central panel spanning the convergent annulus, said second stable shape comprising said annular bead, said convergent portion deformed to extend axially and radially inwards with respect to the side wall and said central panel so held within the compass of the side wall. Fig.11 is a sectioned side view of the can of Fig.10 after double seaming and deformation of the can end. Fig.1 shows a can containing 330ml of a hot liquid product 1. at 85°C with a headspace 2 of 50 ml comprising 58% water vapour and 42% air. The can has been sealed at ambient pressure so the pressure in the headspace is atmospheric (1 bar absolute). Fig.2 shows the same can after cooling to 5°C. The volume of the liquid has reduced by about 10 ml thus increasing the headspace to about 60 ml. The partial pressure of the water vapour becomes mimimal at this temperature and the partial pressure of the air is reduced by virtue of the cooling which it has undergone and by the increase in volume of the headspace through cooling of the product. Thus, the pressure in the headspace of the can as shown in Fig.2 is about 0.4 bar absolute, substantially less than atmospheric pressure. A lightweight (DWI) can is unable to withstand any significant external pressure and will collapse causing panelling of the side wall. Fig.3 and Fig.4 show similar views to those of Figs.1 and 2 in relation to a can having a deformable bottom wall. If this can is similarly filled but without undercover gassing and is then treated according to the prior art by being reduced in volume by 35 ml by deformation of the can base before being cooled to 5°C the pressure will still fall below 0.9 bar absolute. This is low enough to cause the collapse of the can wall. If, however, as now taught, the can headspace is flushed with nitrogen as the end is applied then at the instant of closure the partial pressure of nitrogen in the headspace will be close to 1.0 and the partial pressure of water vapour will be close to zero. Very quickly thereafter the water vapour pressure will regenerate to 0.58 bar absolute and the can will be pressurised to 1.58 bar absolute. When this can is reduced in volume by 35 ml by reformation of the base and then cooled to 5°C the pressure will fall only to 1.5 bar absolute. This is high enough to maintain tension in the can walls and thereby provide the strength necessary to avoid damage during distribution. In practice it will not be possible to completely fill the headspace 2 with nitrogen prior to closing the can. Typical results achieved in practice show about 80% of the headspace gasses are replaced with when using a modern under-cover gassing beverage can seamer. For experimental purposes our test cans were made from drawn and wall ironed tinplate can bodies 65 mm x 115 mm tall, having a bottom wall thickness of 0.3 mm (0.012") and side wall thickness 0.13 mm (0.005") and total volume normally 380cl, which are used to pack 330 cl of liquid product leaving an ullage or headspace necessary for filling. Fig.5 shows a can body on tooling which forms a defomable portion in the bottom wall thereof. A standard can body is shown having a cylindrical side wall 5, a seaming flange 6 and a bottom end wall 3 including a domed central portion 7 and stacking bead 8. The tooling shown comprises an upper punch tool 10, lower punch tool 11 and die 12. Downward movement of the upper punch tool 10 deforms the domed central portion 7 of the end wall 3 by bending over the die 12 into the generally convex shape shown in phantom in Fig.5. The lower punch tool 11 supports part of the portion 7 during this deformation which creates a first stable shape of bottom comprising an annular bead of arcuate cross section joining the side wall to the bottom wall and a convergent annulus 13 extending axially and inwardly from the annular bead to support an outwardly concave central panel 7 spanning the annulus. Fig.6 shows a seamed can on tooling which deformas the bottom wall back to its original shape. The tooling comprises an upper member 15 which bears on the can end 16 and a lower punch tool 11 within a die 12 as before. Upward movement of the punch tool 11 deforms the can bottom to reduce the internal volume of the can by formation of a second stable shape comprising said annular bead, said convergent portion deformed to extend axially and radially inwards with respect to the side wall and said central panel so held within the compass of the side wall. Fig.7 shows the top of a can body with a can end 16 located theron and held in place by a seaming chuck 20. A punch 21 is located within the seaming chuck to act on the central panel 22 of the can end. In Fig.7 and 9 the can end can be seen to have a first stable shape comprising a peripheral seam portion 23 a chuck wall 24 dependent from the interior of the seam portion, an annular bead 25 extending radially from the chuck wall and an inner wall 26 extending from the bead 25 through the level of the seam portion to support the central panel 22. Fig.8 shows the arrangement of Fig.7 after double seaming of the can end to the can body. The punch 21 has also been moved downwards to deform the can end and to thereby reduce the internal volume of the can by formation of a second stable shape comprising the peripheral seam portion and chuck wall, the annular bead and at least part of the inner wall deformed to form a continuation of the chuck wall with the central panel now defining an outwardly concave surface. If required the centre panel 22 of the can end may be provided with an openable portion defined by a score line openable by means of a lever (not shown in Fig.9). One of the many known score and pull tab or lever combinations may be used. Typically the scored can end is made of aluminium having a thickness of 0.18 mm (0.011"). However an unscored can end may be made from aluminium, tinplate or TFS. On the basis of a large series of practical trials we have evolved a mathematical model based on a second order polynomial equation which takes account of these pertubations and brings the theoretical figures into conformity with practical observations. 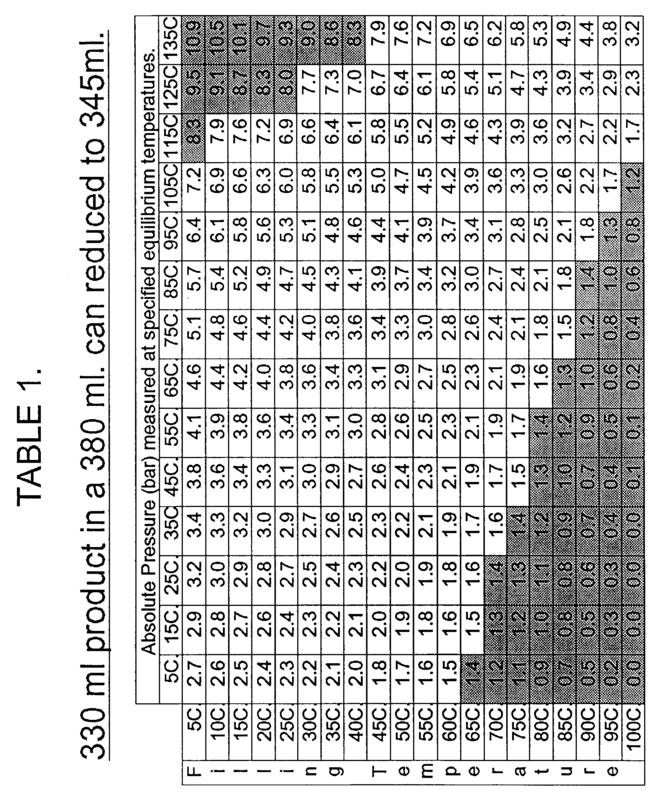 By way of comparative examples, Table 1 shows the absolute pressures expected to arise when a 380 ml can containing 330 ml of product is deformed to reduce its volume to 345 ml. The effect of varying filling temperatures between 5°C and 100°C are represented vertically in each column and the effect of temperature change after the can has been closed is represented horizontally along each row. It is clear from the shaded area in the bottom left quarter of table that the prior art of simply reducing the volume of a can which has been filled hot then stored at low temperature fails to prevent the internal pressure falling below the critical 1.4 bar level at which a DWI can becomes fragile and that cans filled at temperatures above 75°C will develop internal vacuum at refrigeration temperatures such as may arise in domestic refrigerators or vending machines. The shaded area in the upper right of Table 1 illustrates the region in which cans which have been filled cold and are then heated to temperatures above 100°C in order to sterilise them can generate internal pressures above 8.2 bar absolute when the ends will be permanently distorted. This region is of little pratical importance as cans which are to be sterilised are invariably filled hot. apparatus suitable for the accomplishment of this operation known as undercover gassing is described in GB 1263820 and is commonly used to sweep oxygen from the headspace of cold filled beer cans replacing it with carbon dioxide and thereby avoiding oxidation of the beer. Returning to the previous example, if a can of 380 ml total capacity is filled with liquid at 85°C and is closed on a double seamer equipped with such undercover gasing facilities connected to a supply of Nitrogen then at the moment of closing the partial pressure of Nitrogen in the headspace is close to 1 bar and the partial pressure of water vapour in the headspace is temporarily depressed towards zero. Immediately after the can has been closed, the water vapour pressure in the headspace is regenerated from the hot liquid rising to the equilibrium saturated water vapour pressure at 85°C that is 0.58 bar absolute. Thus the pressure within the can rises within a few seconds of double seaming from 1 bar to 1.58 bar. If the nitrogen injected is cold the effect is further enhanced. If this can is now deformed to reduce its volume as before to 345 ml then on the basis of simple theory, the partial pressure of Nitrogen is expected to rise from 1 bar absolute to 3.3 bar absolute whilst the partial pressure of the water vapour is expected to remain unchanged at 0.58 bar absolute bringing the total pressure to nearly 3.9 bar absolute. When such a can is cooled to 5°C we would expect the partial pressure of Nitrogen to fall to 2.56 bar absolute and of water vapour to fall to zero. Thus we expect an internal pressure 1.56 bar above atmospheric well above atmosphere necessary to support the walls of a lightweight DWI can. practical to achieve 100% efficiency of undercover gassing. 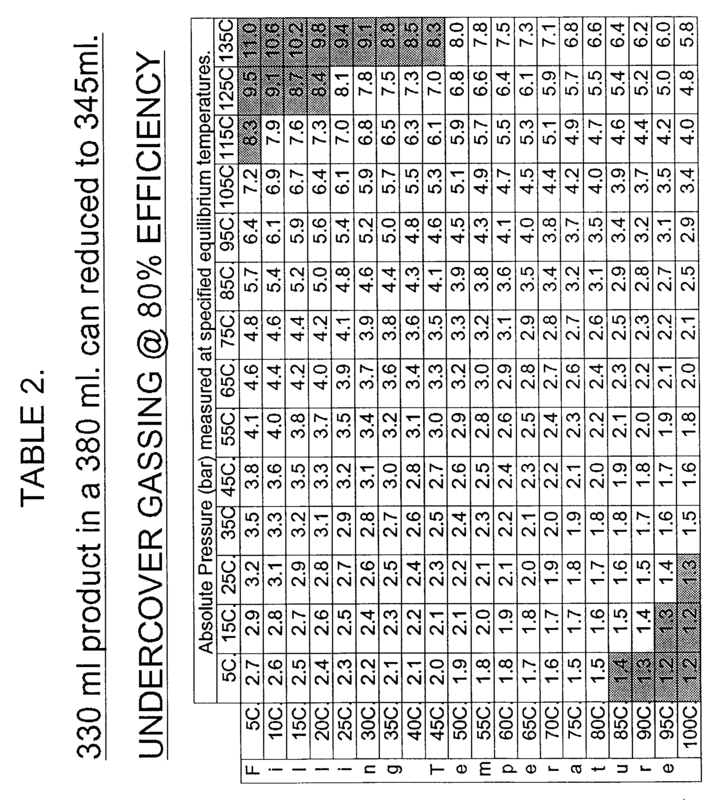 Using a modern beverage seamer we have found it practical to achieve 80% undercover gassing efficiency and have modelled and confirmed by practial trials the pressures set our in Table 2. Table 2 shows that by using this invention it is now possible to ensure that cans filled at temperatures up to 85°C and mechanically compressed maintain pressure above 1.4 absolute even when cooled to 5°C and than vacuum does not result when even higher filling temperatures are attempted. It can also be seen that such undercover gassing does not seriously increase the pressure generated when cold filled products are raised to retort temperatures after mechanical compression. A) Cans which are filled cold and stored at low temperatures such as aseptically filled cans. B) Cans which are filled hot and immediately cooled such as pasteurised acid products. C) Cans which are filled warm then sterilised at temperatures above 100°C such as low-acid foods and drinks. Whilst the specific embodiments described relate to can bodies drawn from a single blank to comprise a bottom wall and integral side wall, it will be understood that the invention may be equally well applied to can bodies having a seamed side wall connected to the bottom wall by a double seam so that the side wall may be made of thin metal. Figs.10 shows another embodiment of the can end which the can end 30 comprises a peripheral cover hook 31, a frustoconical chuck wall 32 dependent from the inner periphery of the cover hook at an inclination of about 5°to a perpendicular to the plane of the can end, an annular reinforcing bead 33 of arcuate cross section extending radially inwards from the chuck wall, an inner wall 34 extending upwardly and inwardly fromthe inner periphery of the reinforcing bead, and a radiused annulus 35 which joins the inner wall 34 to a central panel 36 spanning the inner wall just below the top extremity of the cover hook. The inclination of the inner wall is not critical and maybe between virtually vertical allowing for metal spring back, to as much as 30°. In Fig.10, the can end is resting on the flange of a can filled and undercover gassed can body having a like the can end 30A already attached to the other end of the side wall 37 by a double seam 37. As the centre panel 36A is inboard of the extremity of the double seam, this can body has the advantage that it rests on the seam, not the centre panel which may bulge during thermal processing to become vulnerable to impact and unable to stand upright. Whilst the volume displaced by pushing this "flush top" centre panel, from its first stable shape (as shown in Fig.10) to its second stable shape as shown in Fig.11, is not as great as that achieved by the outwardly protruding panels of Figs.7 to 9 this deficiency can be compensated for, if necessary, by deforming both ends of the can. Depending on the temperature at which the can contents were packed and efficiency of undercover gassing deformation of one end only may suffice. In Fig.11, after forming of the top double seam 39, only the top can end has been deformed to its second stable shape comprising the double seam 39, the chuck wall 32 reinforcing bead and inner reversed radiused annulus 35A wall having become a single continuum 40 of substantially frustoconical shape extending radially and axially into the can body to support the centre panel 36 inside the side wall 37 of the can against internal pressure generated in the can. The centre panel may be flat as shown, or domed to increase its rigidity (not shown). Furthermore the top end of the can may be provided with a score line defining an openable portion. The openable portion may, if desired, be provided with a known form of pull tab or lever attached to the can end by an integral rivet or adhesive bonding. Adhesive bonding is particularly convenient if the can end is stamped from a laminate of sheet metal/polymeric film, eg. PET/metal/polypropylene and the tab is made of a like material so that like polymer film of the can end may be fused to like film of the tab or lever. Advantages of spreading the deformation between both ends of the can body are that each can end suffers less deformation and the stroke of the initial can end forming press and can end deforming press used after filling, may shorter so that these presses can run at faster speeds. As already described with reference to Figs.7 and 8, the can end may be deformed in the double seaming machine. Alternatively one or both can ends may be deformed in a subsequent machine having a rotating turret provided with opposed pressure pads 41 actuated by cooperation of the turret rotation between fixed can profiles or a can profile and support pad if only one end is to be deformed. Fig.11 shows in dashed lines a pressure pad 41 and a flat support pad 42 after deformation of the top can. D) deforming a part of the can from a first stable shape to a second stable shape to reduce the headspace volume thereof and increase the headspace pressure to a level above 1 atmosphere. A method as claimed in claim 1 wherein step (D) comprises deforming the bottom wall of the can body. A method according to claim 2 wherein the bottom wall has a convex base portion comprising an annulus surrounding an outwardly concave central panel and in step (d) pressure is applied to the central panel to deform said convex portion to a concave form which supports the central panel inside the side wall in the form of said second stable shape. A method according to any preceding claim wherein step (d) comprises deforming the can end from a first stable shape to a second stable shape. A method according to claim 4 wherein the can end comprises a peripheral double seam portion, a chuck wall depending from the inner periphery of the seam portion, an annular bead extending radially inwards from the chuck wall, an inner wall which extends from the annular bead towards the level of the seam portion to a radiused annulus which supports a central panel, and in step (d) pressure is applied to the central panel to deform the annular bead and inner wall until the centre panel is passed through the annular bead and the radiused annulus reversed to define with said inner wall said second stable shape. A method according to any preceding claim wherein the permanent gas is nitrogen. A can end adapted for deformation from a first stable shape to a second stable shape, said first stable shape comprising a peripheral seam portion, a chuck wall dependent from the interior of the seam portion, an annular bead extending radially inwards from the chuck wall, and an inner wall extending from the bead towards the level of the seam portion to a radiused annulus which supports a central panel thereabove, said second stable shape comprising the peripheral seam portion and the chuck wall, said annular bead and at least part of the inner wall deformed to form a continuation of the chuck wall, from which depends the central panel at a level below that of the seam portion. A can end according to claim 7 wherein the central panel includes an openable portion defined by a line of weakness openable by means of a lever. said first stable shape comprising an annular bead of arcuate cross section to join the bottom wall to the side wall, a convergent annulus extending axially and inwardly from the annular bead and side wall, and an outwardly concave central panel spanning the convergent annulus, said second stable shape comprising said annular bead, said convergent portion deformed to extend axially and radially inwards with respect to the side wall and said central panel so held within the compass of the side wall. A method substantially as described with reference to Figs.2 to 6, Figs.7 to 9 or Figs.10 and 11 of the accompanying drawings. A can end substantially as described with reference to Figs.7 to 9 or Figs.10 to 11 of the accompanying drawings. A can body substantially as described with reference to Figs.3, 4 and 6 of the accompanying drawings. KR100429785B1 (en) 2004-07-27 Method of and package for sterilized edible material.